The Euler methods are some of the simplest methods to solve ordinary differential equations numerically. They introduce a new set of methods called the Runge Kutta methods, which will be discussed in the near future! Like before, is some function along real or complex space, is the point that we are expanding from, and denotes the derivative of . So, what does this mean? Well, as mentioned, we can think of this similarly to the kinematic equation: where is position, is velocity, and is acceleration. This equation allows us to find the position of an object based on it&apos;s previous position (), the derivative of it&apos;s position with respect to time () and one derivative on top of that (). 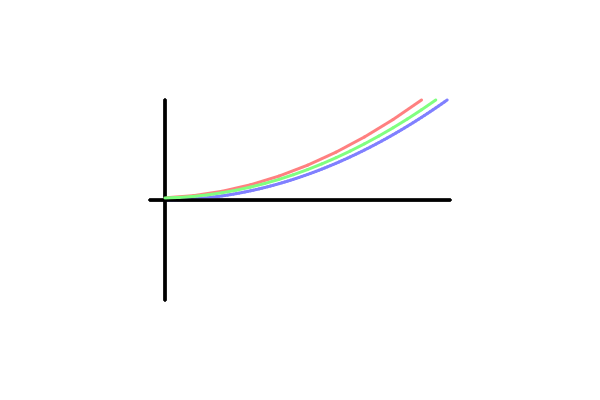 As stated in the Tayor Series Expansion, the acceleration term must also have in front of it. Now, how does this relate to the Euler methods? Well, with these methods, we assume that we are looking for a position in some space, usually denoted as , but we can use any variable. The methods assume that we have some function to evaluate the derivative of . In other words, we know that . For the kinematic equation, we know what this is! Now, solving this set of equations in this way is known as the forward Euler Method. In fact, there is another method known as the backward Euler Method, which we will get to soon enough. For now, it is important to note that the error of these methods depend on the timestep chosen. For example, here we see dramatically different results for different timesteps for solving the ODE . The solution here is and we can find this solution somewhat easily with the forward Euler method shown below. That said, by choosing a larger timestep, we see the Euler method&apos;s solution oscillate above and below 0, which should never happen. If we were to take the Euler method&apos;s solution as valid, we would incorrectly assume that will become negative! 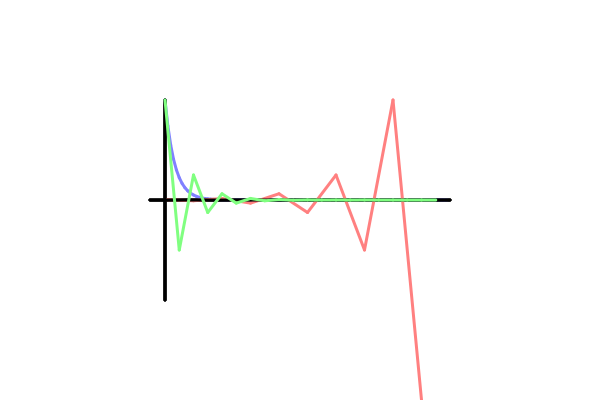 Like above, the blue line is the analytical solution, the green is with a timestep of 0.5 and the red is with a timestep of 1. Here, it&apos;s interesting that we see 2 different instability patterns. The green is initially unstable, but converges onto the correct solution, but the red is wrong from the get-go and only gets more wrong as time goes on. In truth, the stability region of the forward Euler method for the case where with the initial condition that . Note that in this case, the velocity is directly given by the ODE and the acceleration is not part of the model. // and returns whether any value is outside the passed threshold. << "-th value was " << *it << ", but the expected solution was "
then "All values within threshold"
else "Value(s) not in threshold"
The image "FEerror" was created by James Schloss and is licenced under the Creative Commons Attribution-ShareAlike 4.0 International License. The image "FEinstability" was created by James Schloss and is licenced under the Creative Commons Attribution-ShareAlike 4.0 International License.